The latest in Holographic display technology. Offering 360-degree ultra high definition resolution. These super bright light resistant displays allow you to display 3D models and movies that will capture peoples attention. Great for digital marketing, advertising and promotion and events, expos, conferences and showrooms. 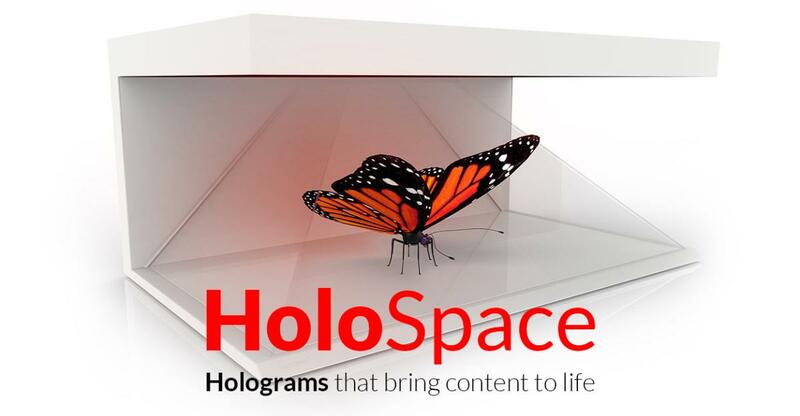 Be the first to write a review for HoloSpace | Holographic Displays! HoloSpace Z Product 55” of Ultra High Definition Holographic Content. Blow your audiences away with something they’ve never seen before. At this level of image clarity, reading text is like reading a book, except books don’t float in front of you and respond to your hand gestures in real time. Holospace Tablet Product Create your own holographic experiences at home with you by turning your own smart device into a miniature holographic display. Holospace tablet works with your Apple or Android tablet, and allows you to customise your own content or pick from 100’s of 3D models. Holospace Mobile Product Create your own holographic experiences at home with you by turning your own smart device into a miniature holographic display. Holospace mobile works with your Apple or Android phone, and allows you to customise your own content or pick from 100’s of 3D models.